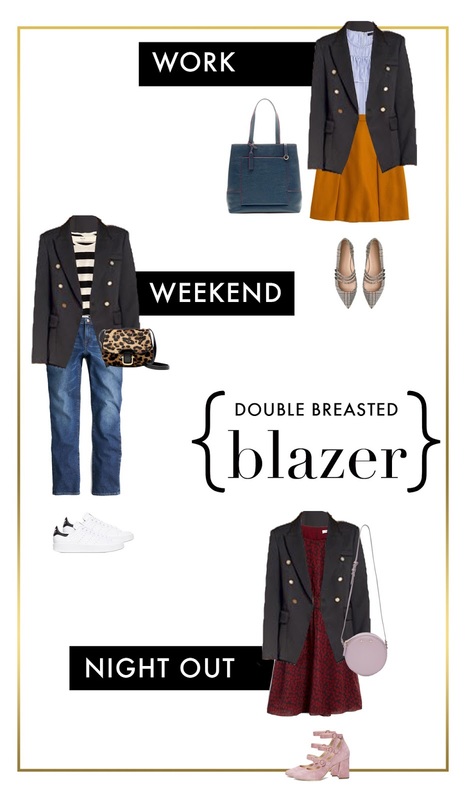 A double breasted blazer is a wardrobe essential. Think of it as a grown-up and chic version of a denim jacket (another item every wardrobe needs btw). Despite being a wardrobe workhorse, however, a good double breasted blazer is surprisingly hard to find! I have been searching for the past couple of years! Then, one day as I was perusing the new arrivals at Shopbop and I spotted this beauty. The price was excellent, the cut was modern, and the fit looked decent. I decided to go for it because it was just the piece I needed for California. With a double breasted blazer, you can turn almost any dress or top and skirt combo into workwear. It also goes great with jeans or a flirty dress when you need an extra layer for a night out. This blazer turned out to be perfect. I ordered a medium and took it straight to the tailor. Because a good double breasted blazer is so versatile, it is important it fits just right. Fortunately, I have noticed several fab and affordable double breasted blazers available at the moment (like this one). So now is the time to strike if your wardrobe is missing this essential piece. You can see my favorite picks below. What are your wardrobe workhorses?